While many established guitar brands offer a travel-friendly model or two, the Californian-based company Traveler Guitar is focused solely on building great travel guitars. Despite the tiny size, their AG-105EQ (also known as the AG-105E) boasts a full-sized playing experience, as well as some other interesting features. It’s a slight step up in terms of price when compared to many others in this market, so let’s take a look at whether the extra performance is worth the extra cash. Unlike many of Traveler Guitar’s other models, such as the Ultra-Light, the AG-105EQ looks less alien and more like an actual mini hollow-body acoustic guitar. The good news is that playability is not compromised here with a full-size 25.5” scale length and standard string spacing, all crammed into a guitar that is 20% smaller and 36% lighter than your standard dreadnought. So, dimensions-wise, you are looking at a total length of just under 33”, with a 4” body depth. The materials used are good for the price and provide both reliability and a nice sound. The top is a solid spruce, while the back and sides are made with laminated mahogany, all finished in satin. The neck is also made from mahogany, with a black walnut fretboard and 20 jumbo frets. It’s genuinely hard to find a flaw here – it plays well, especially when you get used to the lighter weight and less of a body to hold. The set neck is comfortable and quite fast, with a satin finish, while the build quality feels like you could take it around the world without it breaking the first time it’s stuffed into an airline overhead locker! Most notably, the AG-105EQ is loaded with a Shadow Nanoflex pickup, featuring a custom-made Shadow preamp. This is a good system for performers, with volume and 2-band EQ controls included, along with a phase button for feedback reduction. Perhaps most useful is the built-in digital tuner, which eliminates the need for carrying an external device around with you. It also comes with an 1/8” headphone jack and a handy aux-in jack. Electronics aside, the lack of a headstock on the AG-105EQ shouldn’t cause concern – the tuning is all done at the base of the body, with knurled tuning knobs in a pretty cool antique bronze finish, matched by the locking nut at the top. In fact, everything about this little acoustic is well thought out and executed very well. It naturally comes with its own quality padded gig bag, with space for extra storage along with both backpack straps and a shoulder strap. With the guitar in the bag, you’re looking at a total weight of around just over 5lbs. The beauty of the AG-105EQ is that it can be used for structured performance purposes (think coffee house or street corner) through an amp, but the unplugged tone is great for practice and more impromptu performances (think campfire, beach, and so on). With the reduced size, you can’t blame it for lacking a bit of projection and low-end, but it’s not as quiet as you may assume. The tone, meanwhile, is well balanced with good warmth – a bit boxy, but the spruce/mahogany combo doing its job. The AG-105EQ is a winner! There are many other small or travel-friendly acoustics out there at half the price, but if we were going around the world and had to take a hollow-bodied acoustic with us, this would probably be our pick. Whether it’s worth the cash for you depends on how much traveling you plan to do, but with solid tone, build and hardware, it shows good value. For more info about the Traveler Guitar AG-105EQ, click here. 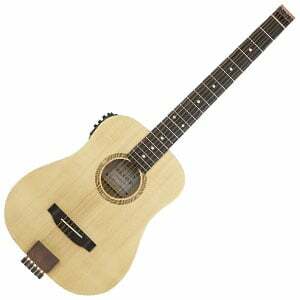 For more Travel Acoustic Guitars you might like, click here.